Personal finance can be a dry topic. Reasons can be many. For a start, it is a vast topic with many options, hence suffering from paradox of choice. Then, it lacks instant gratification, something we like. Worse still, it involve some self-disciplining... Damn still... it is more work. No wonder I have a modest crowd to my budgeting app, despite being express and free. To make things fun, my friend @Douglas Owusu introduced me to a free multiplayer online game richdad (inspired by RichDadPoorData philosophy of Kiyosaki?) I see many remain stuck in the inner circle of paycheck to paycheck. Possibly an eye opener for many. I think discussing with like-minded friends will keep afloat. Knowledge sharing will hopefully divide the work. Need to diversify revenue streams. I invite suggestions from readers? I hear from my large clients claiming how much money a contractor makes compared to a full-time employee (FT). I have always wondered the real cost of a contractor to a client. So, I did the maths, and surprisingly the results show that the dollar cost is about the SAME! How? 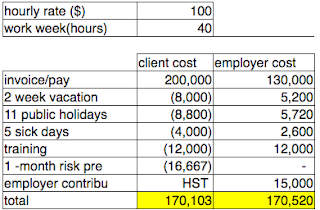 Assume contractor cost of $100 per hour, and pay of the similar FT is at $130,000 with a modest annual combined contribution of CPP, EI, TFSA, RRSP and severance insurance of $15,000. I subtracted 1_month_risk_premiums from contractor invoice since a contractor is always on the hook! Both worker types cost about the same. Am I missing something? Whether contractor can get more take home income is another story. Possibly, at the cost of risk of express redundancy, no severance, no EI, filing additional taxes, self-training etc. For a FT, an employer has to provide most of them. Then, why does the employer prefer FT? Likely, the government incents for keeping FTs. An FT has to be loyal for, at least, three years and grows with the employer. The truth is my fellow contractors and I are delivery-ready, love our work, want to deliver, avoid bureaucratic meetings and be responsible for our own learning. With automation on AI steroids, we are going to see the job market becoming exponentially fluid and temporary e.g. Experfy, Upwork etc. My plea to the clients is embrace us, not hate us -- we don’t cost you extra!